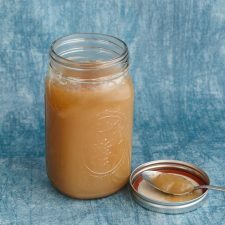 A basic recipe for chicken stock, including tips for better gel and storing. Divide the chicken into 9 pieces -- 2 wings, 2 thighs, 2 legs, 2 breasts, 1 back. (If the chicken neck is included, cut or break into several pieces.) Place chicken pieces in a large (6-8 quart) pot with water and salt. Boil for 30-40 minutes or until chicken is cooked through. Skim off any brown foam from broth. Transfer chicken to a platter and allow to cool until easy to handle; reserve broth in the pot. Place bones, celery, carrots, onions, and garlic in a roasting pan with 1/2 cup of water to cover the bottom of the pan. Bake in a 400° oven for 45 minutes or until bones are a dark golden brown..
Bring to a boil. 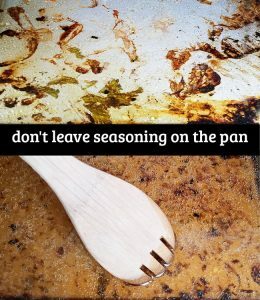 Reduce heat and simmer for 6 to 24 hours (remove any brown foam with a slotted spoon). The longer it simmers, the richer and more flavorful it will become. Add the parsley the last 10 minutes of simmering. Stock can be stored in the refrigerator for up to 5 days or frozen for later use. If using a 12-quart stock pot, double the recipe. Any time you have bones leftover from a baked chicken or turkey, freeze them until you are ready to make a stock. It is not necessary to roast the bones and vegetables, but the flavor is well worth it.